Below is a feature request that is certainly beneficial for many users that are concerned with the implementation of new compliance requirements by the GDPR. In short, the feature is intended to be an extension to the Consent Manager. Currently, there is only one interface for the inclusion of cookie permissions to Matomo, but no "copy / paste" script (as it is available with the opt-out script). 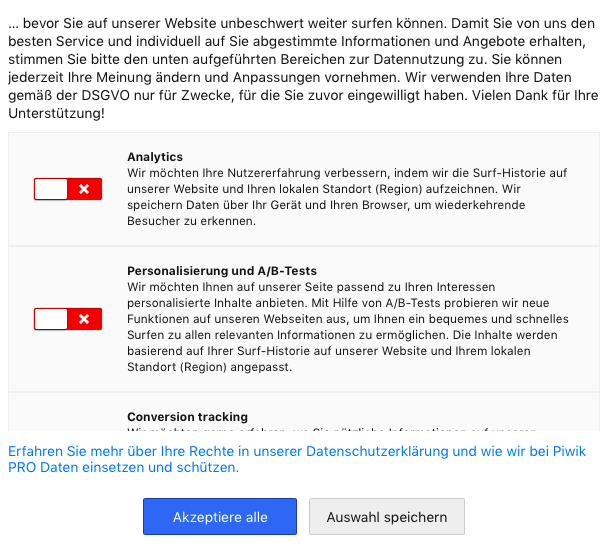 Many customers have to obtain the permission of the visitor actively, according to the regulations of the GDPR, where a simple opt-out is no longer enough. The service provider PIWIK Pro has already solved this very appealingly. Such an option would be very useful for Matomo. Does this 'solution' load any content at all from the backing-up server? If so, you can trash the whole thing because you are not allowed to load ANY content before content is given (if you take the opt-in approach). In the moment any request reached the Matomo server, you contacted an external server which might already be a problem. The better solution is to handle the contens yourself and afterwards load the tracking script dynamically.